‘Mohl’ is a simplification for the sake of Europeans of the Tswana surname Motlhakangna.1 As a child, Mohl used to draw with ‘pepa’ on rocks and animal hides. He also modelled objects of clay. His father carved pestles and chairs. At school in Dinokana and later Mafikeng, Koenakeefe (little crocodile) was often reprimanded and punished because of his insatiable urge to draw during classes. Mohl’s father was convinced that he was wasting his time at school and withdrew him to herd the goats. However, the Reverend Hale of the London Mission Society, who noticed the young boy’s talent, convinced his father to allow him to spend time drawing and to attend Tigerskloof Training School. There he attained a teacher’s diploma and subsequently left for Namibia to work on the docks at Lüderitz in order to study art with a French woman artist, Mary du Pont. She gave him a sound foundation in preparing canvases and applying art materials. Hale and other friends of the London Mission Society and Lutheran Church later sent him to continue his art studies at the Academy in Düsseldorf. He returned to Cape Town and in 1936 painted Kgosi Tshekedi Khama’s portrait, which was shown on the Empire Exhibition. In 1943 he won an Academy award for painting. Mohl established an art school, White Studio, in the backyard of his home in Annadale Street, Sophiatown in 1944. In 1948 he was commissioned by the then Bechuanaland government to paint places of historic importance in the territory and between 1953 and 1954 he painted Moeng College and King Khama’s Memorial Stone for Kgosi Tshekedi Khama. Mohl was a founder member of Artists under the Sun in 1960 and he served on the committee of this organization until his death. After the demolition of Sophiatown, Mohl moved to Soweto where he eventually settled in Moroka in the mid-1970s and held exhibitions of his paintings in his garden. He played a leading role in the affairs of the St Francis Anglican Church which was close to his home in Moroka and also painted a panel of the Crucifixion for the church. He also gave art lessons at the Madibane and Orlando High Schools in Soweto. In 1972 Mohl founded the Moroka Sympathising Friends Scheme which he also chaired. Lybro Nyelele, Credo Mutwa, Helen Sebidi and his wife Puseletso Mohl also studied art with him. Mohl’s art records the changes that took place in southern Africa during the 20th century. It is a testimony of life as he experienced and observed it from Dinokana to Johannesburg. He painted rural and urban life with equal devotion. The stretches of open, unpolluted space in his landscapes are in stark contrast to the grey smoky air of his Witwatersrand scenes. While he shows the idyllic side of life in the countryside in his farming scenes, the devastating veld-fires raging at night expose the counterpart. His paintings of miners on their way to or from work express the plight of the faceless, dehumanised worker. Miles, E. 1997. Land and Lives. Human and Rousseau: Cape Town, Johannesburg and Pretoria. p. 58. Born Dinokana, Zeerust in the North Western Province, 1903; died Soweto, 1985. Training c.1930 onwards: Düsseldorf Academy, Germany (all records lost during World War 2). Exhibitions 1936: Empire Exhibition, Milner Park, Johannesburg. 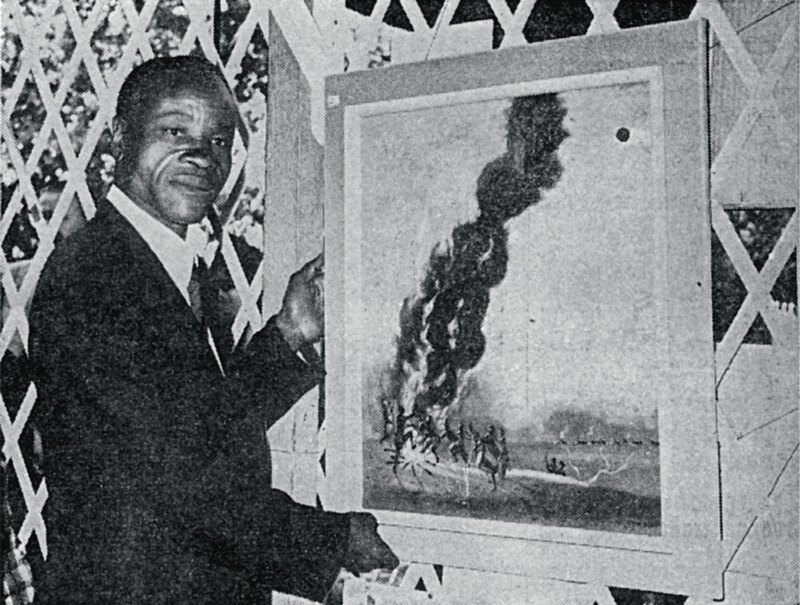 1941–1943: Solo exhibition, Bloemfontein; South African (Transvaal?) Academy, Duncan Hall, Johannesburg; Transvaal Art Society, City Hall, Johannesburg; Solo exhibition, Art Society Room, Stuttafords Building, Johannesburg. 1946: South African Academy, Johannesburg Art Gallery; South African Society of Artists, Ashbey’s Gallery, Cape Town. 1948: South African Academy, Johannesburg Art Gallery; Rural Paintings, Herbert Evans Art Gallery, Johannesburg. 1957: Solo exhibition, Christ the King Church, Sophiatown, Johannesburg. 1963–1965: Apollo Art Gallery, Johannesburg with Mizream Maseko; Solo exhibition, Apollo Art Gallery, Johannesburg; Christmas cards (auspices of SAIRR), Adler Fielding Galleries, Johannesburg; African painters and sculptors from Johannesburg, Piccadilly Gallery, London. 1970: Africa Art Project, Gallery Elysia, Johannesburg; Africa Art Project, YWCA, Dube, Soweto; Africa Art Project, Dorkay House, Johannesburg. 1986: Historical perspective of Black art in South Africa (1930–1986), Alliance Française, Pretoria. 1988: The Neglected Tradition, Johannesburg Art Gallery. 1993: Land and Lives, SAAA, Pretoria. 1997-1998: Land and Lives, Johannesburg Art Gallery; Nelson Mandela Metropolitan Art Museum, Port Elizabeth; Tatham Art Gallery, Pietermaritzburg; Iziko South African National Gallery, Cape Town. Collections BHP Billiton Collection, Johannesburg; Johannesburg Art Gallery; MTN Art Institute, Sandton; Iziko South African National Gallery, Cape Town; South African Reserve Bank, Pretoria; UNISA Art Gallery, Pretoria. John Koenakeefe Mohl exhibiting in Joubert Park, Johannesburg, in 1962. Source: “African Artists take their place in the Sun”. Zonk, July 1962, p. 15. Photographer unknown.